WATSONVILLE, CA - Around the holidays, you’ll be sure to find mushrooms on most plates, and Monterey Mushrooms has the perfect way to get consumers talking about mushrooms even more! The company created a holiday-themed seasonal package for its product line, Let’s Blend™, which are finely diced mushrooms ready to blend with ground meat. According to a company press release, Let’s Blend comes in an 8 oz package and is available in three pre-seasoned flavors: Classic, Mexican, and Italian. Let’s Blend packages are available now next to the fresh mushrooms in the produce department of select grocery stores nationwide. 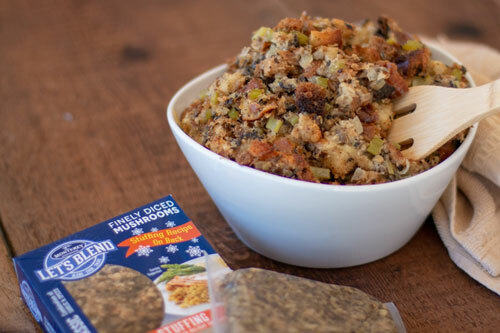 The seasonal package can be found for the Classic version and offers consumers blended versions of recipes for holiday favorites, such as stuffing and green bean casserole. 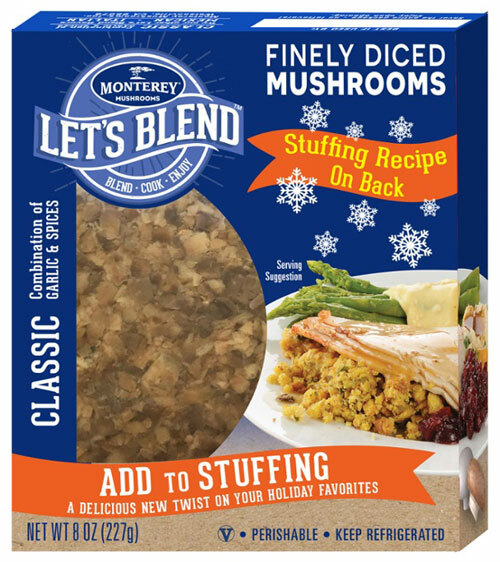 Monterey Mushrooms noted that Let's Blend is a time saver during the busy holiday cooking season. Because the mushrooms are pre-chopped and seasoned, all the user has to do is open the package and blend with their preferred ground protein. “We hope people make Let’s Blend finely diced mushrooms part of their holiday celebrations,” Roberts concluded. For the latest in fresh produce news like this, keep reading AndNowUKnow.